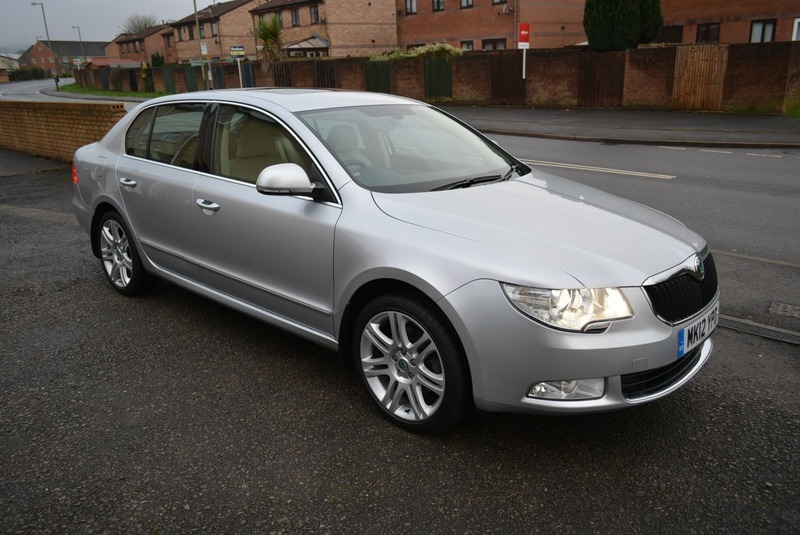 DEPOSIT PAID....DEPOSIT PAID....2012 SKODA SUPERB ELEGANCE AUTOMATIC 2.0 CRTDI HATCHBACK WITH THE RANGE TOPPING LAURIN & KLEMENT PACK IN ABSOLUTELY FANTASTIC CONDITION. ONLY 26,206 MILES 1 OWNER FROM NEW FULL SERVICE HISTORY METALLIC SILVER WITH BEIGE FULL LEATHER UPHOLSTERY. THIS SPEC HAS JUST ABOUT EVERY CONCEIVABLE OPTION. IT OFFERS A LOT FOR YOUR MONEY AND COSTS £4,000 MORE THAN THE NEXT TRIM DOWN. TO MENTION A FEW IT HAS A LARGE 6.5" TOUCH SCREEN SATELLITE NAVIGATION SYSTEM--BI-XENON HEADLIGHTS--ADAPTIVE CRUISE CONTROL--UPGRADED STEREO SYSTEM--UNIQUE 18" ALLOY WHEELS UNMARKED LIKE NEW--SUNROOF--DSG GEARBOX--PARKING SENSORS--ELECTRIC HEATED & FOLDING MIRRORS--ELECTRIC SEATS WITH MEMORY--HEATED SEATS--CLIMATE CONTROL--ELECTRIC TAIL GATE--AND A GREAT DEAL MORE. THIS REALLY IS A SUPER LUXURIOUS CAR IN PERFECT CONDITION WITH A VERY LOW MILEAGE AND EXCEPTIONALLY WELL LOOKED AFTER BY THE ONE AND ONLY OWNER. EVERYTHING ABOUT IT IS JUST RIGHT. 6 SERVICES ENTERED IN THE SERVICE BOOK, THE LAST AT 24,945 MILES ON 09-07-2018. AT THIS TIME THE CAMBELT AND TENSIONERS + WATER PUMP WERE CHANGED. MOT TO 18-12-2019. EXCEPTIONAL VALUE-- WELL BELOW MARKET PRICE-- I FEEL YOU WILL NEED TO BE QUICK IF YOU FANCY THIS ONE.